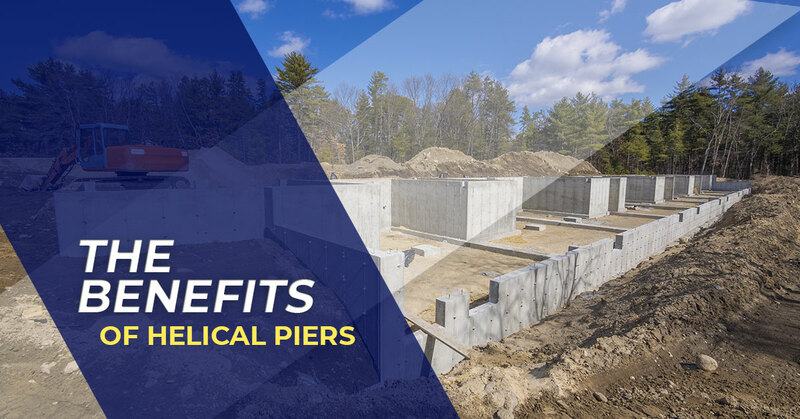 The advantages of helical pier foundation system have made the use of helical piers a popular choice among architects, contractors, structural engineers, and builders. Helical piles, also referred to as helical piers or screw piles, are commonly used for different types of deep foundation solutions. At Magnum Piering, we are one of the industry leaders in manufacturing high-quality steel piling products, like our helical piers are just what you need for you deep foundation project. In this article, we are going to review the applications as well as a few of the benefits of helical piers. Magnum helical piers are used to transfer loads from the soil near the surface to deeper, more suitable load-bearing bed below. Helical piers are commonly used in conjunction with various foundation attachment brackets to underpin the foundations of existing structures. They are usually installed vertically, as for supporting gravity loading, but may be installed at an angle if necessary to help stabilize the foundation against lateral loads. They also are used to underpin distressed foundations but can be used to support light loads such as wing walls, interior floors and porch slabs as well as heavier ones such as single- and multi-story structures. As you may know from some of our previous posts, helical piers are great for building foundations in the sand and other challenging soils. However, they are plenty of other benefits. Due to their size, helical piles do not require special equipment like cranes to be transported. Installation is surprisingly quick and easy and is not dependant on weather conditions. What’s more, helical piles and anchor systems are unique when it comes to other types of foundation systems, as there is no wait time for concrete or other materials to set and harden. This is because helical pile systems can be loaded immediately after installation. Compared to other types of foundation construction, helical piles come with the benefit of minimal-to-no site damage. Screw-pile systems do not require soil cutting, which helps keep the project site clean and intact. Since heavy-duty equipment is not needed and the installation process is fairly simple, the production of construction vibration is borderline nonexistent – a must have for some areas that are environmentally sensitive. Additionally, screw piles can be installed, left in place for years, then removed and reused at another site leaving little-to-no impact on the original area. When repairing the foundation of a structure, it is essential that there is plenty of stability. While push piers stability and resistance can be limited, helical piers provide much more capability for remaining stable during the process of foundation repair. Helical pile systems are traditionally installed vertically, but this does not define their limitations. These systems are incredibly versatile in their ability to be rearranged to several orientations to fit the needs of any foundation project. They can be installed horizontally to assist in earth-retaining projects and can easily be fitted for lateral loading. Additionally, state-of-the-art technology of helical piles allows them to be easily configured to increase load capacity, by simply adding helical plates into the mix. Because helical piles are easy to transport and install, they generally save architects, contractors, structural engineers, and builders some money. The helical pile installation process also reduces the mess and project cleanup that typically is associated with other foundation systems. There is no threat to long-term spending either, as there is technically no maintenance or upkeep is required. What’s more, these systems are reusable, recyclable and transferable, adding to both economic and environmentally friendliness. When repairing the foundation of a structure, it is crucial that it is done as accurately as possible. Helical piers offer a lot when it comes to ensuring that a structure is repaired as accurately as possible. When installed, handheld equipment is used that allows you to see exactly how much resistance and how much torque is being used. It also indicates when to stop digging. The extra precision of these piers allows for the job to be done with great results each and every time. As you can see, there are plenty of benefits to using helical piers for deep foundation solutions. However, the solution is only as quality as the type of helical piers you use. If you want the best helical piles for the foundation project your business works, contact Magnum Piering. We are committed to supplying our clients with only high-quality products and materials that they need for a job well-done. When you choose to work with us, you not only receive quality products, but top-notch service and support to back them up. To learn more about Magnum helical piles, helical pile foundation systems, or any of our other steel piling products, contact us today!